The Centre for Newcomers and Downstage are partnering to create a program that will offer targeted mentorship to newcomers with past experience in theatre, helping them build connections in their new community and showcase their talents. This is a brand-new project, and will be adjusted and expanded in future years. Our showcase event will be hosted August 27, 2018 at 7:00 pm in partnership with Arts Commons Presents. Downstage is a professional theatre company with a mandate to produce Canadian theatre that creates meaningful conversation around social issues. Our mission is to achieve a social impact through artistic excellence. Read more about us at www.downstage.ca. Sleman Aldib, a Syrian newcomer, has been in Canada since December, 2015. He is also an actor, writer, director and professional photographer. His piece for Sage Theatre’s 2018 IGNITE! Festival, بالعكس (The Opposite), was an experiential piece that invited Calgarians to think about what would happen if war came to Canada, and where they might find refuge. He has also written and directed ياسمين (Jasmine) and الخطف من الخلف (Snatched from the Back). Thank you for signing up for occasional emails from Kawalease ACT! Ekta Srivastava trained at the Darpana Academy of Performing Arts in India where she studied acting. Her performing experience has included short films, street plays for NGOs, and working as a radio host. She has also studied and taught Bollywood dance, belly dance and several Latin dance styles. Since moving to Canada last fall, she has started studying at the Company of Rogues. Jenny Duno graduated from the prestigious Juana Sujo theatre school in Caracas, Venezuela, where she worked as a professional actress and drama instructor for more than fifteen years. She has directed numerous plays with children and teenagers, assistant directed at Grupo Actoral 80, and done voiceovers and production for audiobooks for children. Since moving to Calgary in 2014, she has been actively volunteering as an usher at Theatre Calgary, an interpreter at the Calgary Immigrant Women’s Association, and a student mentor at Bow Valley College where she is studying English. Raffi Minas is an actor, writer and drama therapist passionate about implementing creative, strength-based treatment plans. He has 12 years experience, including writing and performing in pieces such as Dream and me & him, working as an actor and trainer in interactive theatre projects, and as an actor in Undocumented, a web series in Lebanon. 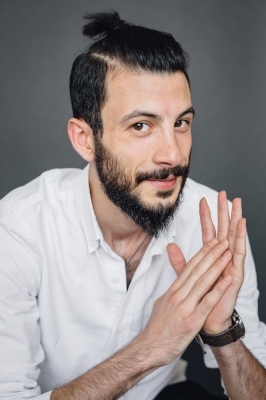 His drama therapy practice includes five years of experience working with refugee youth in Syria and Lebanon, including projects with UNICEF and the Syrian Arabic Red Crescent. He has worked in partnership with psychologists to support children who were internally displaced within Syria to write and perform stories from their experience. His most recent project was with the Syrian League for Citizenship, facilitating interactive theatre sessions with men in Syrian refugee camps focused on gender-based violence. He came to Canada in October, 2017.